The iconic Maracana Stadium is lit (R) at dusk behind a shanytown, or "favela," on Dec. 10, 2013, in Rio de Janeiro, Brazil. 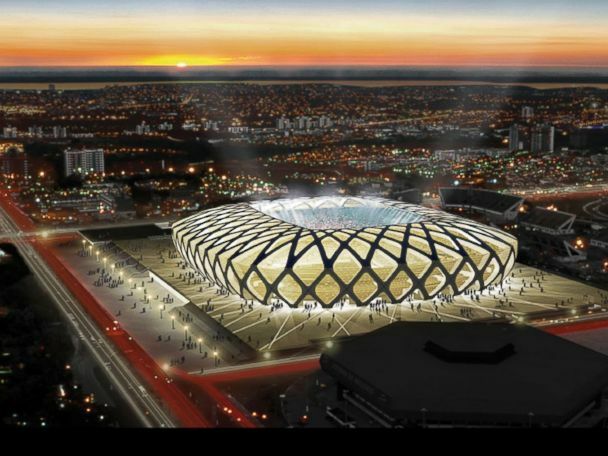 The stadium will host the final match in the 2014 FIFA World Cup Brazil. Luiza, Janubie, Leiticia and Lucas sit beneath an overpass near their houses in the unpacified Complexo da Mare, one of the largest "favela" complexes in Rio de Janeiro, on March 18, 2014. The group of 16 communities house around 130,000 residents while plagued by violence and poverty and dominated by drug gangs. Mare is located close to Rio's international airport and has been mentioned as a likely pacification target for the police. Rio's Police Pacification Unit (UPP) now controls 38 of the city favelas amid efforts to improve security ahead of the 2014 FIFA World Cup. Youngsters play during a project of former Brazilian football player Jair Ventura Filho, a.k.a. Jairzinho, to find a talent at Varginha shantytown in Rio de Janeiro, March 20, 2014. Jairzinho was part of the Brazilian national team, which won the FIFA World Cup in 1970. Paramilitary police special unit personnel (in black) maintain security for Brazilian soldiers conducting a search for weapons in the Favela da Mare slum complex in the northern suburbs of Rio de Janeiro, March 26, 2014. Louis Carlos de Sousa (L) and Tania Gonzalves pose in their home in the unpacified Complexo da Mare, one of the largest "favela" complexes, March 29, 2014, in Rio de Janeiro. The Brazilian government is deploying federal forces to occupy the group of violence-plagued "favelas" ahead of the June 12 start of the 2014 FIFA World Cup. Police keep watch near the pacified Pavao-Pavaozinho community, just blocks from Copacabana Beach, on April 23, 2014, in Rio de Janeiro. Protests and shootings broke out recently, resulting in the shooting death of a man, following the discovery of dancer Douglas Rafael da Silva's body, who protesters allege was beaten by police, in the pacified "favela." People mourn over the casket at the funeral of dancer Douglas Rafael da Silva, who was shot and killed, on April 24, 2014, in Rio de Janeiro. Da Silva's body was discovered in the pacified Pavao-Pavaozinho community, just blocks from Copacabana Beach, on April 22. Protests and shootings broke out as a result after protesters alleged he was killed by police in the pacified "favela." Workers help construct a hotel with rooms to be available for tourists in time for the 2014 FIFA World Cup in the Cantagalo shanty town, or favela, on May 1, 2014, in Rio de Janeiro. A shortage of hotel beds in Rio has led to demand for alternative housing around the city and many tourists will opt to stay in some of Rio's slums in order to save money. More than 300,000 visitors are expected in Rio where they will compete for 55,000 hotel beds. Children play in the rubble of a former home next to construction in the Manguinhos "favela" on May 10, 2014, in Rio de Janiero. Residents from one section of the favela, visited by Pope Francis in July 2013, have been affected by construction from an improvement works project begun in 2008. A full sanitation system has yet to be built. Some have been evicted from the area as Rio prepares for the 2014 FIFA World Cup and Rio 2016 Olympic Games. Children living in the affected area have been injured from playing in the rubble while complaining of breathing problems from dust and stomach aches. An artist from the Cia Base circus group performs in the show Futebol Voador (Flying Soccer) during the International Circus Festival in the Vila Cruzeiro slum, or favela, on May 12, 2014, in Rio de Janeiro. The International Circus Festival ran until May 18 in Rio and the 2014 FIFA World Cup begins June 12. A suspect is handcuffed by military police during a joint operation including the CORE police special forces near the Complexo do Alemao pacified community, or "favela"on May 13, 2014, in Rio de Janeiro, Brazil. Ahead of the 2014 FIFA World Cup, Rio has seen an uptick in violence in its pacified slums. A total of around 1.6 million Rio residents live in shantytowns, many of which are controlled by drug traffickers. A man and woman walk near the remains of demolished homes in the Metro Mangueira favela, near Maracana stadium, on May 17, 2014, in Rio de Janeiro. The homes were thought to have been knocked down for a parking lot for the stadium, though that has yet to be built. Evictions and demolitions have been occurring in Rio favelas ahead of the 2014 FIFA World Cup in spite of a housing shortage in the city. Alternative affordable housing, generally on the outskirts of the city, is unable to meet demand and some residents complain they have not received adequate compensation for demolished homes. UPP (Police Pacification Unit) officers patrol next to a mural of dancer Douglas Rafael da Silva Pereira in the pacified Pavao-Pavaozinho community at the start of an investigation into the death of Pereira on May 26, 2014, in Rio de Janeiro. Protests and shootings broke out following the discovery of Pereira's body in the "favela." Ahead of the World Cup, some of Rio's pacified favelas have seen an increase in violence, including a number of shootings in Pavao-Pavaozinho. Elizabeth (not her real name, to protect her identity), 21, rides on a train to go participate with other members of the Black Bloc group in a protest against the FIFA World Cup at a slum in northern Rio de Janeiro, May 30, 2014. Elizabeth lives with her father and works as a lab technician at a hospital, earning 1,100 reais (482 USD) per month. Carlos Lucas kicks a ball along a dirt road in the Santa Luzia favela, in Brasilia, Brazil, May 30, 2014. The 2014 Brazil World Cup is set to begin next week, with Brazil and Croatia competing in the opening match on June 12. 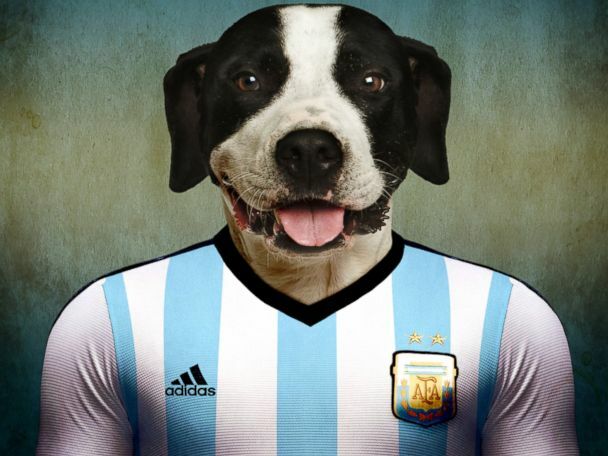 Dogs wear the 2014 World Cup Jerseys of their home country.